To read more, click on “Read More and Comment” below. This month has been a popular month for anniversaries, with Despect reaching one year since he was promoted to Assistant General Manager (Community) on September 18, me reaching my one year as Assistant General Manager (Content) on September 21, and DJ_Shadow also reaching his one year as Rare Values Manager on September 21. 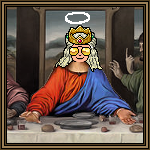 However, taking the crown is FlyingJesus who reached the two-year mark on September 1 as Events Manager! Unfortunately, it wasn’t all exciting news this month as we sadly saw the resignation of both our Help Desk Management: Sloths and Tupoxi. After Sloths having been in management for one year and six months, and Tupoxi as her assistant for six months, I’m sure the department will be strange without them! However, there were some positive management changes, with James being promoted to Assistant Competitions Manager, and Nic01e and LidyaWillows being appointed our new Recruitment Management! For organising popular games tournament AND bakeoff, two massive comps this month! For being a great addition to the Events Department since joining. Lidya always goes above and beyond to help out everyone at Habbox, she is very active and participates in almost everything! Unfortunately not all nominations can win a prize, but we do have some honourable mentions to share too! While these are new members of the team, it would be outrageous to not mention them as their contribution over the last few weeks since they joined has been amazing! Events and Content (in that order) are lucky to have them and we see good things in their future. Our event this month is one of the most ambitious we’ve ever held! We’ve had some fantastic feedback. We’d like to specifically thank David who created an insane THIRTEEN rooms for the event and tested them all out by setting up a guide. Also to two builders: Ben, who has literally been working the extra, extraaaa mile in the department and has helped out the other builders so much with their furniture and wiring, and Ozad for always being so reliable and passionate. We’ve seen him up his game a lot since he joined and looking forward to what’s next! One of the things we’re really keen to do in the Forum department is to put together some more forum events and mini-games over a few days or a long weekend. As it was Fashion Week coming up shortly after Laura took back over, she hit up the lovely forum team and Yellowbelli and the forum and comps departments banded together for our first themed weekend! With a whole fun forum long weekend of double tokens, special icons, competitions and several hours of events on the client and the radio all for fab Habbo clothing! We had loads of people take part over the different types of events with 4 big prize winners (congrats to lucyecc, RuthOnToast, FlyingJesus and Ekelektra) overall. It was a great success – even though the Project Runway and Cozzie Change events didn’t quite go to plan! We’ll have another one soon.. comment with your theme ideas! This year’s HabboxStarz followed a musical theme, and all entrants were required to enter the contest with a song from a musical, or with any act that focused on musicals. Having received ten entries, all clips were played live on air during the three-hour show on September 30, where listeners were later given a chance to vote for their favourites to win! The first place winner won a whopping 300 Credits, with second place winning 150 Credits and third place winning 100 Credits. In case you missed the show, all entries can be found here. Congratulations to our three winners! Their names and entry can be found below. Did someone say something silly? Screenshot it and send it in by clicking here. Be careful what you say or you could end up here next month! A brand new set of songs for this month’s Top 10 list, apart from three songs that have made another appearance! How Long was released in October 2017, making it just a year old. It only ever reached number 9 in the UK charts, although it sold 400,000 copies within a year of it being released. Released in October of 2017, also makes this song a year old. Reaching a high number of 2 in the UK charts, selling 400,000 in the UK alone. Budapest was released in December of 2013, making it nearly 5 years old. Really doesn’t seem like it, does it? Anyway, reaching a great 3 in the UK charts and selling 1,800,000 in the UK alone. Queen, our Radio Managers favourite band! I Want To Break Free was released in April of 1984 makes it over 34 years old and it’s still going strong! Only reaching level 3 in the UK charts. In The End was released in October 2001, making it 17 years old, younger than me! Only reaching number 8 in the UK charts. But selling 618,000 in singles, reaching the Platinum certificate. Shout Out To My Ex was released back in October 2016, making it only 2 years old this year. Reaching an impressive FIRST in the UK charts and selling 1,200,000 copies, which have gained them a 2× Platinum certificate for their troubles. Shotgun is one of George’s new songs, only being released in May 2018, making it only 5 months old. So far, alongside Little Mix, has reached a whopping FIRST in the UK charts so far, selling 600,000 in the UK alone. This is the third time this song has made an appearance on the list, only dropping one place since last month’s list. No Tears Left To Cry is one of Ariana’s new songs, only being released in April 2018, making it a child with only being 6 months old. Reaching second in the UK charts and selling 600,000 copies, giving her Platinum status. Katy released I Kissed A Girl back in April of 2008, making it only 10 years old. Reaching the FIRST position in the UK charts, selling 706,000 copies and reaching a Platinum status for all that, ain’t bad ey? This song has dropped one place since it’s #1 placing on last month’s list! Spice Girls released Wannabe in July of 1996, reaching the highest number of FIRST in the UK charts and selling 1,385,211 copies of Wannabe in the UK, giving them a title of 2× Platinum selling artists on this song alone. This song was placed at #2 in last month’s list! Well, that brings us to the end of September’s most played songs on Habbox.com. See you next month! The hotel may have been created last month, but in September 2000 it was all official and open to everyone. A new way of buying Credits… the landline phone! For a 50p call, you would get 5 Credits. Britney Spears visited the hotel probably to promote her third album – Britney. Habbo Spain and Italy opened up, and they’re both still open today! Habbo USA opened the next year and was the third English speaking hotel. The Gold Trophy was only given out by Staff as a prize so of course, everyone tried to get one when it was accidentally released into the Habbo USA catalogue for a few minutes on September 29. The classic Iced furniture range was first released. It has been recoloured many, many time since. Habbos had nowhere to hide with the introduction of the stalk feature. Maybe they could hide on the newest hotel, Habbo Russia. More achievements were added and to show them off the badge area was expanded to show six instead of one badge at a time. The Urban furniture range was released, as was minimail and a brand new room navigator. Everyone who asked for Battle Ball to come back had their requests heard with the introduction of Battle Banzai, a revamped version that users could create and host themselves. German-speaking Habbos could use it as an icebreaker to meet new users when Habbo Switzerland and Germany merged. Lots of rare versions of pets were up for sale: including the Golden Dragon, Pink Spectre Spider and Blue Disco Lion. Or, if you wanted a monkey instead you could get one with the new Lost Monkey app. The clouds campaign brought four pretty new room backgrounds and two Limited Edition Rares, the Cloud Throne and Pearl Dragon Egg. To celebrate going back to school the golden_apple name Limited Edition Rare was released. Yep, that’s what it’s called and the name still has not been fixed. Running with the back to school theme like last year, the Dorm range was released. Habbos could make their own University dorms, or buy them pre-made by getting the four Habbo Main Street Bundles. Probably the most expensive Room Bundle ever was released: the Habbo Crown Jewels Bundle which sold for 4,350 Credits and 435 Diamonds. It was so exclusive users could only buy it once – if you could afford it in the first place! Everyone who still wanted classic Battle Ball to come back had their requests heard again with the release of five different Battle Ball Bundles that were based on the classic Battle Ball lobbies. The Dessert Cafe and Elegant Bundle were released full of completely new furniture that has never been released except for in these bundles. Firstly, September 2008 (10 years ago!) we won the award for Best Overall Favourite Fansite, as well as awards for news, features and forum! In 2012, a forum staple was brought in! The “Who Has Read This Thread” feature is only 6 years old – can you believe it? This month we’ll be shining the spotlight on our Events Manager, FlyingJesus, who has now been managing the department for a whopping TWO YEARS! Hey Tom! Two years is a long time to stay in a management position. Did you expect to still be in the role in two years’ time when you were promoted? Absolutely yes, there has never been any doubt about my ability to remain static for long periods of time. The Events department has seen managers come and go for the last few years, with a new management team put in place every few months. What has kept you motivated enough to stay this long? Support from other staff tbh. I won’t pretend to have always gotten along with everyone but we’re mostly pretty good at bouncing off each other’s energy. It also helps a lot that I personally have more faith in the current AGM team than any in my long history at Habbox, so it’s not a chore to do what I do. Tell me a bit about your Habbox history! Have you had any previous staff positions before joining Events in 2016? You know I have because this would be a RUBBISH question otherwise. But yes, back in 2008 I joined the Articles staff and also took on the role of Community Support Manager, before telling nvrspk4 (the GM at the time) that both of these departments should be shut down and merged with others… which he did. The only time he ever listened to my advice I’m sure but there you go. Anyway, Articles returned a few years later and I am currently manager of that department as well as Events right now *+*+*+ so talented and humble. Twelve years is a long time to dedicate to a fansite, what’s your favourite thing about Habbox? Is there anything you dislike? What do you do with yourself when you’re not online managing two departments? Crikey that’s a bit personal. I mean yes I do enjoy a good long wa………lk but I don’t go around shouting about it. Regardless of whether or not it’s possible if you could create any real-life game on Habbo to host, what would you create? This dude keeps asking me to make Guess Who which would be hilarious but omf so much work to make it actually playable, and then explaining the rules to noobs like Ruth-On-Toast would be insane. One more question for you. In one sentence, how would you sum up the Events department? Why should people sign up? I like bees and also I guess we have a good reward system which is nice too. The first competition asks you to guess what item I’m looking at in the image below using the clue below. Once you think you have figured it out, comment on this article with your guess! Note: your guess doesn’t have to be unique, a random correct entry will be chosen! The second competition tests your knowledge of Habbox Badges. 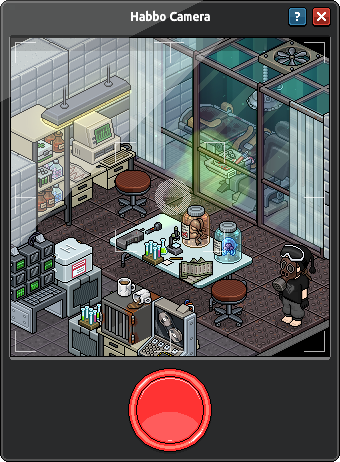 The competition asks you to tell us what year the Habbox Badge below was available on Habbo! Submit your entry via this form HERE. Remember to select Competitions in the drop-down menu before submitting (a text box will appear upon selecting Competitions in the tab, use this to write your answers!). If you’re not sure, take a guess! That’s it for this month! If you’d like to contribute in some way for next month’s edition, feel free to contact me on HabboxForum (Sho) or via Habbo (Shonly). If you’d like to offer feedback, which I’d greatly appreciate, please submit it via this form and selecting Feedback in the drop-down menu at the top! “I spy with my little eye something that is hot” – WOW this one is easy… its Shonly of course. I’m gonna say the Box Computer because computers can get hot especially if they’re old. I spy with my little eye something that is hot; spilled coffee on top of the animal crate.